This will never go down as one of the premier episodes of the franchise. The TV Guide description ends any hope of that: “Takato and Henry bring their Digimon on the school bus for a class trip, only for them to be called into action when a chicken eats all the electricity in Tokyo. Guest starring Chester the Talking Owl.” Doesn't that sound more like the synopsis of a Hunters episode? And the owl's name is Chester. I am making that official right now. Despite its silly premise and all the silly stuff thrown in, it's quite solid. In fact, I'd argue that it's the overall silliness of the entire excursion that keeps the episode afloat. Sinduramon is third of the twelve Devas, so he doesn't symbolize a lot and feels like just “the next one in line” more than most. The class trip is bound to create some unusual encounters, and the show is smart to recognize that this is bound to be closer to fun filler than emotional adventure and just goes with it. Now that the entire class seems to be privy to Guilmon, they are active accomplices in sneaking him aboard as Takato distracts Miss Asaji. Not that that's difficult, as she seems to hate this trip from the get-go, and part of the scheme relies on the (ultimately correct) assumption that she will fall asleep before the bus is out of the city. Between her amazing ability to sleep through Kenta's public domain karaoke session and contemplating a sexual harassment suit against Mr. Mori, Miss Asaji's bare minimum approach is a small but appreciated addition to the series. Mr. Mori's desperate come ons and reaction to Guilmon and Terriermon in the tent allow him to contribute as well. 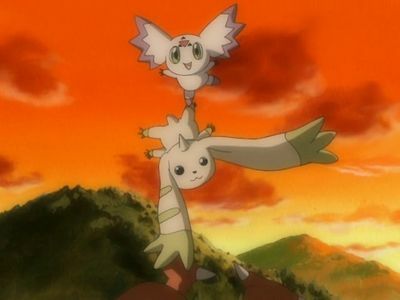 If we are to draw anything from it, it's that all three tamers are already concerned about how much action their Digimon are seeing, and are destined to see, thanks to the Devas. Takato and Henry go through with all this because they want Guilmon and Terriermon to get some R&R and fresh air. Even Rika feels compelled to buy Renamon an energy drink, sort of a token gesture of thanks and a reminder to keep up the good work. Renamon makes a big deal out of it, which is a kitsune thing that I can't get into without plagiarizing another website. This works to Takato and Henry's disadvantage as the Devas do not follow a set schedule. Sinduramon is not going to delay his attack when he gets an out-of-office auto-reply from Guilmon. 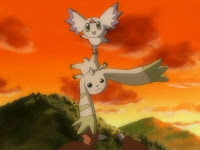 In fact, it's downright negligent that Takato and Henry spot this Digimon, hunt it down alone and decide that it's too small to bother fighting. They don't even scan the thing; their D-Powers would surely tell them (after that strange delay) that this was an Ultimate and needed to be dealt with while it was still weak. Instead, they give it a miss and allow Sinduramon to black out the whole damn city. Great work, heroes. So instead of popping off an easy kill while Sinduramon's still in its formative stage, they end up confronted with a gigantic chicken with electric attacks. That battle ends up being rough, but Growlmon and Gargomon flip Sinduramon into the water where he's electrocuted and dies. No big deal. But Chester... good God what the hell is up with that? 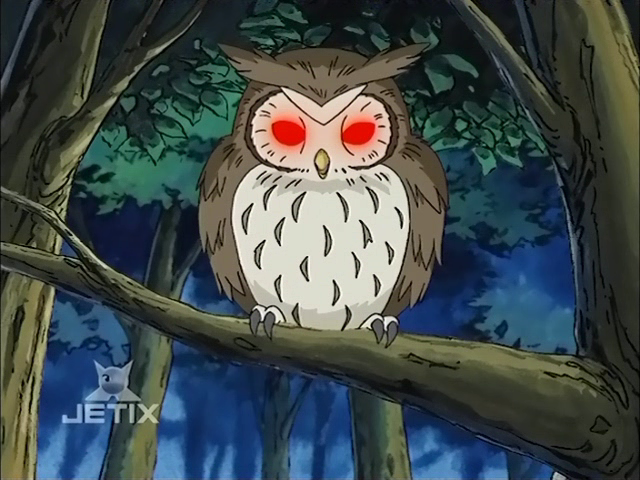 He's not a Digimon or anything... just a talking owl that seems to exist only to give Takato and Henry nightmares. His unfortunate speech patterns takes the sting out of it a little (as does his talk of a “chicken of vengeance”), but he just stands there with those crazy eyes talking about the coming of the Devas like some goddamn Cheshire cat. Then he flies away like nothing happened! Worth pointing out now that Konaka has a bit of a thing for Alice in Wonderland too. It'll come up again. Miss Asaji's solution to Takato's distraction of a broken camera is that he's a kid and the trip is one of those childhood memories he'll hang on to forever. Teacher of the Year! Jeri interprets Takato smuggling Guilmon aboard as him being a really nice guy, causing a blushing spell. I promise we'll talk about these two one of these days because it's kinda important for once. Kenta turns his awful public domain karaoke into an awful lounge act, complete with the “try the veal” lines. Miss Asaji does well to sleep through it. During Kenta's awful public domain karaoke/lounge show, Guilmon asks Kenta to teach him how to make his voice funny. What's amusing about this is that Guilmon and Kenta have the same voice actor (and yes, he's Yamaki too). In a show of positive team spirit, Takato and Henry openly dis Rika, mocking her as Guilmon and Terriermon play in the water. And this with the knowledge that the city went dark the night before. There wasn't a whole lot of worrying about friends and family during this massive blackout. 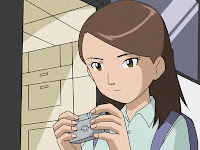 Yamaki makes a pretty compelling argument for his concern about the tamers' Digimon. Knowing how strong the Devas are, he should be plenty worried about the forces strong enough to eliminate them. *Best Evangelist/Edwin Starr impression* "It's the DAY-VAH who drinks from the light of man!" "But Chester... good God what the hell is up with that? 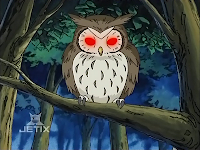 He's not a Digimon or anything... just a talking owl that seems to exist only to give Takato and Henry nightmares. His unfortunate speech patterns takes the sting out of it a little (as does his talk of a “chicken of vengeance”), but he just stands there with those crazy eyes talking about the coming of the Devas like some goddamn Cheshire cat. Then he flies away like nothing happened!" Wasn't Sinduramon possessing him? Chester's eyes go back to normal and he flies away once Sinduramon dies, suggesting that Sinduramon was responsible for making it act like a southern preacher. If anyone asks me, that Nami Asaji is hot. I didn't know that fact about energy drinks and kitsunes, but I think you're overanalysing it a bit. I think Renamon was just super touched because Rika was always very business-y and not one for displays of affection or for gestures like gifts to this point. It's probably the first reward (other than Rika's occasional praise) she's ever received for something.